Smoothies have turned out to be the neatest trick to getting more veggies into my diet. Today I decided to experiment with a new vegetable (and a new color): carrots. I’ve been pretty successful when matching the same color fruit and vegetable, so I opted for a mango-carrot smoothie. To amp up the nutritional value and to make it more filling, I added goji berries, avocado, and chia seeds. This smoothie is packed with Vitamin A. So what’s the big deal about this vitamin? Vitamin A helps maintain healthy skin, teeth, mucus membranes, and skeletal tissue, and it promotes good vision. 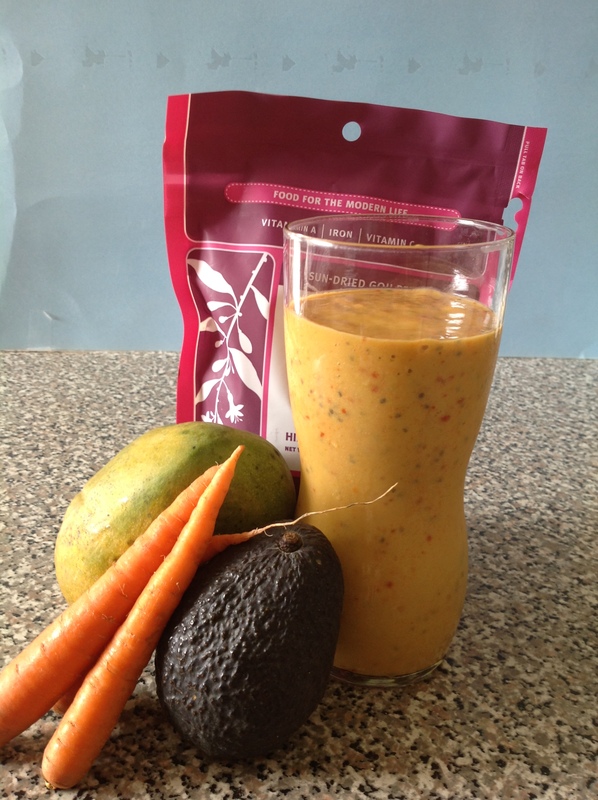 This smoothie delivers about 300% of your daily vitamin A needs – 1 cup of mango has 25% of your daily need for vitamin A, while 1/2 cup chopped carrots has over 200% and goji berries contain about 68% in 2 tablespoons. Although Vitamin A is a fat-soluble vitamin and thus can be toxic if ingested in large amounts, this is highly unlikely to happen from consuming foods (only from vitamins), as your body only converts the amount of Vitamin A that it needs. That’s just another reason that, when possible, we should get our nutrients from whole foods, not vitamins! They key ingredients for the mango-goji smoothie. What better way to improve the best-tasting food out there than by combining the best of two culinary traditions? I learned this when eating Mexican-inspired sushi at a Japanese-Mexican fusion restaurant in San Antonio. 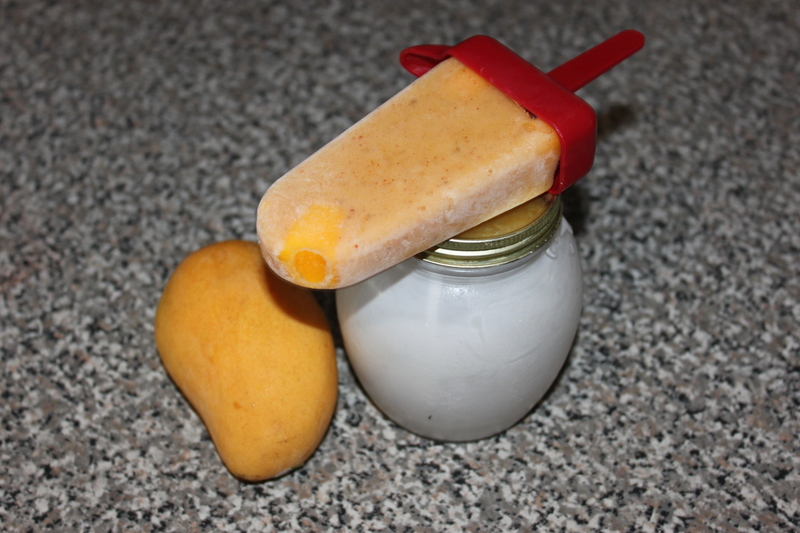 And I decided to apply this lesson when creating my chili-mango lassi popsicles. These pops were first inspired by the popsicles featured on Joe Cross’ site. I tried this recipe, but did not enjoy the banana taste mixed in with my mango. I also wanted to spice things up a bit, and since living in south Texas I have loved adding chili to my fruit. I did, however, like the combination of mango and coconut milk, which tasted like the Indian lassi drink. So the combination of these wonderful Indian and Mexican-inspired flavors resulted in these great popsicles. I’m proud to say that these popsicles are raw. They are also dairy free, sugar-free (free of added sugars, at least), gluten-free, and soy-free. They are also really delicious. 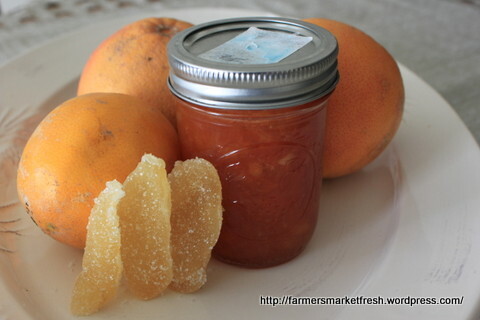 Start light on the chili if you are not used to heavy chili flavor with your sweets. 1.) 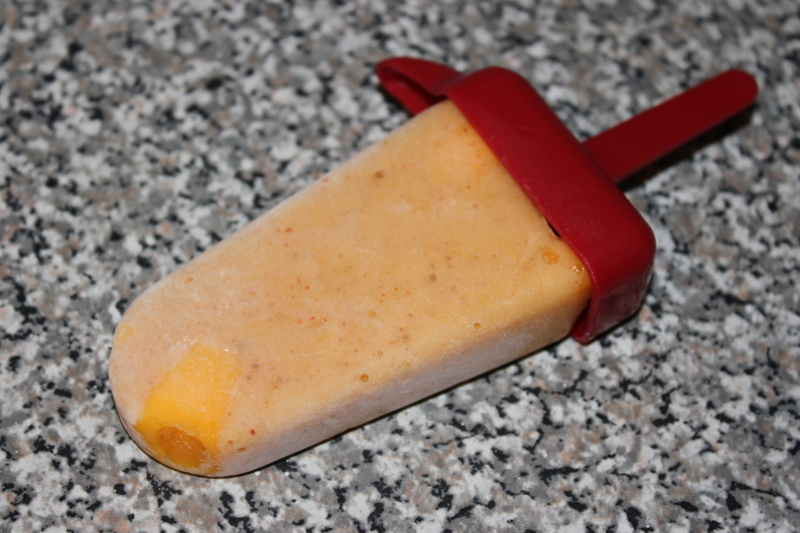 Place some of the extra mango pieces (if using) in the bottoms of the popsicle molds. Scoop out the scored mango flesh and place in blender. 2.) 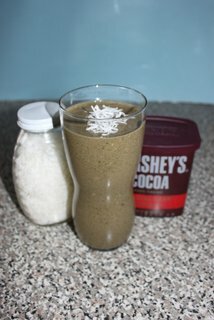 Add the coconut milk and ice to blender and blend completely. 3.) Add chili powder to taste. I recommend adding it little by little to ensure you like the taste. If you do not enjoy the taste of the popsicle in liquid form, you won’t like it in popsicle form! Blend. 4.) Pour liquid into the molds, leaving a bit of space at the top if you are planning on adding more mango pieces. Add these pieces to the molds and push in with the end of the popsicle stick (so that the mango pieces are spread throughout the popsicle). As a 6-year-old, I used to think that eating spinach would magically give me Popeye’s superhuman strength. I disliked the taste of spinach, but remember loading up one evening for dinner knowing that later my athletic friend and I would race each other. Unfortunately, the spinach did not turn me into a Popeye-style racing machine. Nevertheless, according to Livestrong.com, it’s a nutritious food, containing plenty of calcium (for bones), beta-carotene and vitamin A (for healthy skin, eyes, and immune system), lutein (to prevent muscular degeneration), and folate (to prevent birth defects). It also helps prevent cancer, making it a winner nutrition-wise. Baby spinach, which I use in my juices, has the same benefits of other spinach varieties. 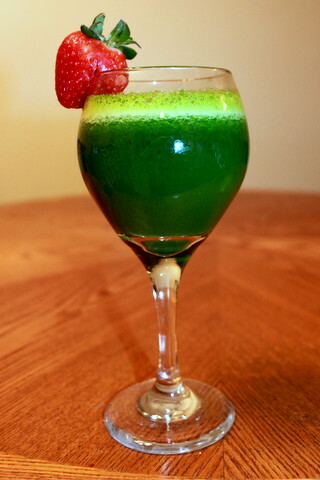 While the idea of “spinach juice” does not appeal to me even as an adult, blending it with sweet fruit is a whole new take on the concept. And adding some herbs gives the combination a je ne sais quoi – sophistication, perhaps? Below is my favorite recipe, which uses only three ingredients. Combine ingredients in juicer according to juicer directions. Best served chilled!